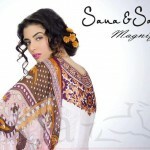 Sana & Samia Celebre Lawn By Lala. Lala Textiles is now one of the well-known names in the textile and fashion industry of Pakistan. It offers good quality textiles at quite reasonable prices. It offers simple fabrics as well as premium fabrics for women. Different retail brands are owned by Lala. In addition to Sana & Samia, it has La Femme, Kesa and Lala Classic. Lala Textiles started out as a simple textile firm many years ago and is now one of the top firms of Pakistan.popular Sana & Samia Celebre Lawn By Lala.